A collection of 399 Mainly Old-Time Traditional Songs with lyrics and chords from American popular vernacular music, with downloadable PDF for printing. Scroll down for a list of all available titles. 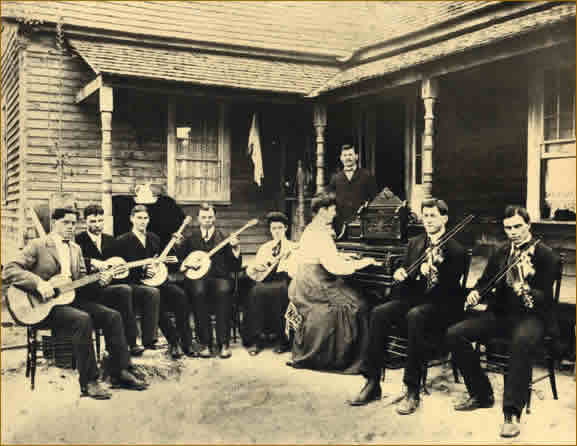 THE SONGS IN THIS COLLECTION are from the American popular vernacular music idiom, and include folk, traditional, regional and religious songs. Some of the songs mention artist, vocalist or composer names, this should not be taken to mean that they are an accurate version of the piece as performed or composed by the named person. Also the keys and chord sequences chosen may also vary considerably between versions by different artists. Many of these songs are in the public domain or traditional categories, however, this cannot be guaranteed, and should you wish to use them as a basis of a performance or for any non-personal study purpose you are advised to contact the copyright holders (where available, copyright info has been included with the song). These transcriptions are made by many different individuals from all over the world for their own research and instruction, and as such are liable to great variation in interpretation and opinion. They are being shared on this site for educational purposes only, please see our copyright page for more info. Most of these songs consist of lyrics with chords marked but some also include guitar tabs.. Although primarily intended for guitar these chords should also be suitable for use with other instruments such as Ukulele or Banjo. Many of the song pages, particularly those including tablature, extend to several pages. To avoid large slow to load pages only the first page is displayed, in these cases you will need to DOWNLOAD the PDF file to all the song pages. Click on the song you want to see.